Shallots are starting to be seen in grocery stores more and often lately. What are shallots? Like onions and garlic, shallots are a member of the allium family. 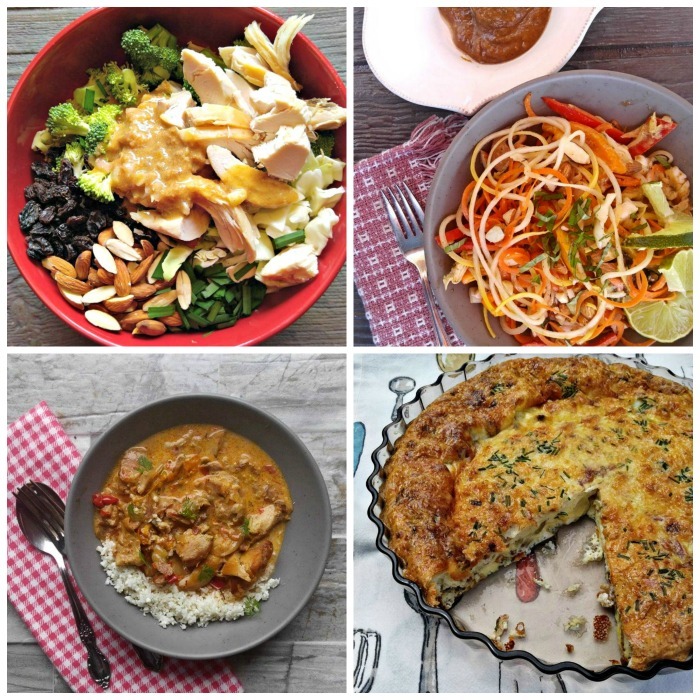 Their flavor is richer and sweeter and they are very versatile in recipes. 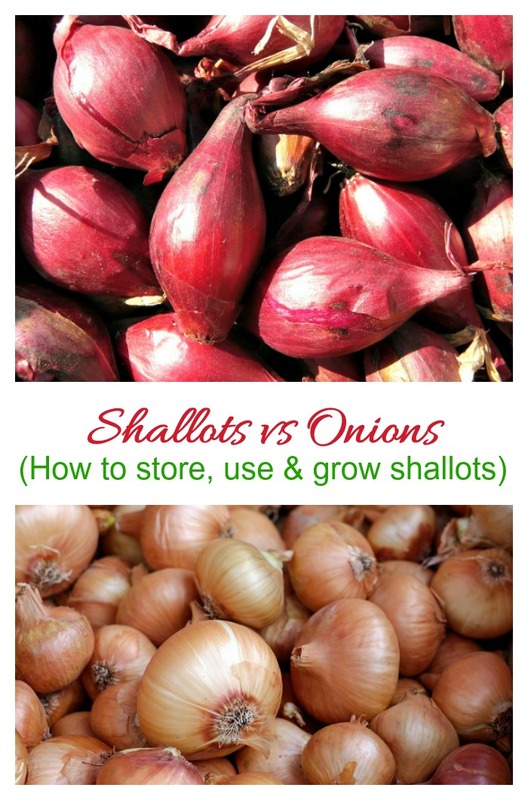 This guide will show you how to use, store and grow shallots at home. On my recent grocery shopping trips, I’ve been noticing these magenta and brown skinned bulbs that look like elongated onions. I’ve never used them in the past, so I picked up a bunch of shallots a few weeks ago to find out for myself what they are all about. I have been doing some fun garden projects with onions lately, so the size of these seemed like they might be something that would work out for me. There are many types of the Allium family of vegetables. Shallots are one of them. Find out about the onion varieties here. A shallot is a small bulb that resembles an onion and is used for pickling, or as a substitute for an onion. Gardeners sometimes refer to them as potato onions. Shallots come in sizes from small to jumbo with the smallest being the most tasty. I can attest to this. I have bought shallots individually (small ones) from Kroger than have a lot of flavor, and I have bought a large bag of them from a bulk warehouse store that were much larger and had far less flavor (and they were much cheaper in price.) The younger the shallot is, the milder the flavor, so size does matter! They LOOK like onions (well almost) and they TASTE like onions (only milder) so it begs the question – are shallots onions? The answer is yes, sort of. They are both bulbs in the allium family, they both are bulb shaped and they both have skins. The differences come in the shape and taste. 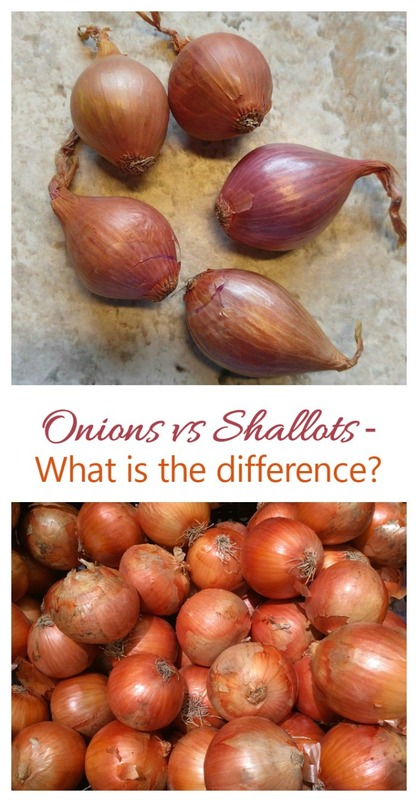 If you look at a picture of a shallot, it will show you that the obvious difference between onions and shallots is their shape. Onions are commonly round in shape and shallots seem to take more after cloves of garlic. It appears to look something like an elongated onion, in my opinion. Both onions and shallots come in more than just one color. Yellow and purple shallots are the most commonly seen variety. Even though these two vegetables look nothing alike, people often confuse the two since they are both in the onion family and start with the letter S. While they are both a type of onion, a scallion (also called a spring onion or green onion) is long and thin with green leaves and a white bulb, where the shallot is bulb shaped and has a colored skin. A shallot has a milder flavor and aroma than an onion does. For this reason, it is more common for shallots to be eaten raw. Sizes and Types of Shallots. There are several different types of shallots and they vary in both size and taste as well as in planting and harvest times. Anyone who has found shallots at a grocery store has probably picked up French shallots. The French Red is most often sold commercially. 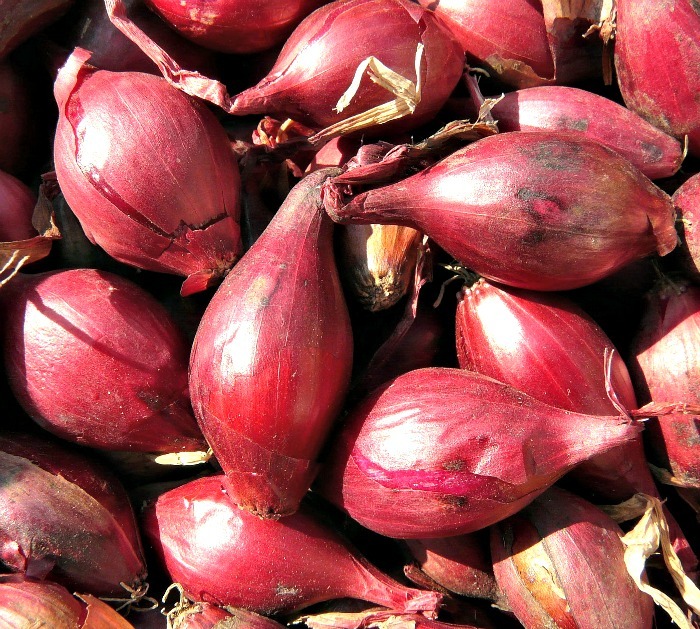 The French shallot varieties have brownish-red skins, pink-purplish flesh and are pear-shaped. Dutch varieties are grown quite often. They have a taste that is more like an onion and they feature an orange-yellow skin and creamy yellow flesh. Dutch bulbs tend to be rounder and smaller – usually about 2 inches across. False shallots – also called Jersey shallots are are much larger and have less flavor. True shallots are smaller with a more subtle flavor. Hybrid shallots are grown from seed instead of from sets, and planted in the spring. Hybrids store better than normal French and Dutch shallots. If you have just one or two shallots to use, just cut off the bottom end and make a very thin slit in the side skin with a sharp knife. The whole outer skin will peel away. If you have a lot of shallots called for, you can try soaking them in boiling water for 2-3 minutes until the outer skins soften. Cut the top and bottom off and push the shallot out through the top opening. What is a good substitute for shallot in a recipe? The best shallot substitution is an equal ration of 1:1 shallot to chopped yellow onion. (not 1:1 whole onions because of the size difference.) If the recipe calls for more than one cup, slow down on the amount of onion. Recipes that call for shallots want that mild flavor, so too heavy an onion flavor will overpower the recipe. Adding some garlic also makes the flavor of the onions more like shallots. Another good substitute is the bottom white part of the spring onion if the recipe will be cooked, or the green top if it is a raw dish. You won’t get quite as strong an onion taste as a shallot but you also won’t have the extra heavy onion taste that a normal onion gives. Cooking shallots can make them lose flavor easily, so if you are making something like a stir fry or caramelized onions, where you want the flavor to shine, choose onions. Shallots also have a softer texture than onions do when cooked. Because of their mild flavor, they are a great choice for kids who are a bit finicky about onion eating. Shallots make a great addition to steamed veggies such as Brussels sprouts. Potato and pasta salads that ask for raw onions would benefit from the use of a shallot instead of an onion. Roasted Shallots. Roasting any vegetable brings out its natural sweetness so a vegetable that starts out sweet like a shallot will have this flavor enhanced when they are roasted. To roast them, just preheat your oven to 425º F and rinse the shallots. There is no need to peel them. Roast until the skins are golden brown and blistered and the flesh is tender – about 50-60 minutes. 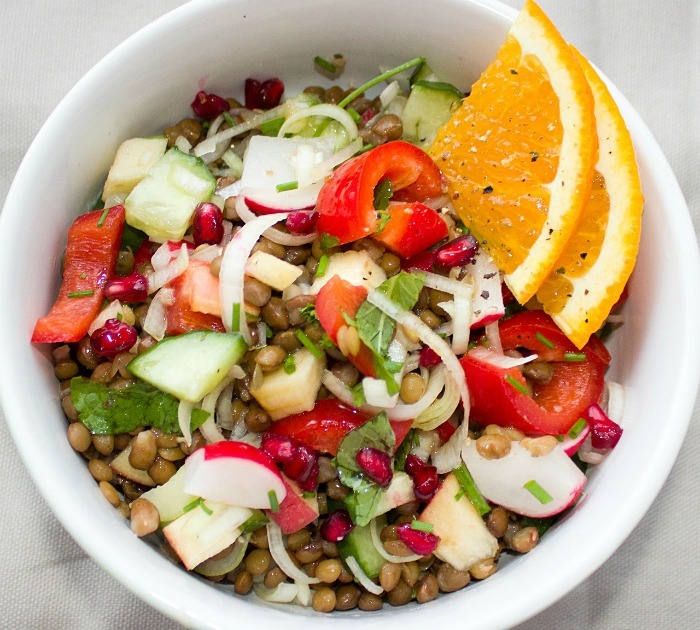 Root vegetables can add up in the calorie department but shallots are not too bad. An average sized shallot clocks in at 31 calories, has just over a gram of protein and no fat. The mild flavor of a shallot makes it the perfect choice to use in salad dressings to get a light onion flavor, as well as the contents of the salads themselves.Try one of these shallot recipes to get an idea of the flavor. This Broccoli Salad has an orange almond dressing that is flavored with the mild taste of shallots. In this Asian Zucchini Noodle salad, shallots are used in place of onions to keep the salad mix from having too much of a bite to it. Try this crustless Quiche Lorraine for a light breakfast option using shallots. Shallots keep the sauce on this crock pot curried chicken dish very light and aromatic. Mushrooms, shallots and garlic make the sauce on this Balsamic Chicken recipe a keeper. Look for a firm young shallot that is free of sprouts. The bulb should be dry and firm and it should have a nice covering of the papery skin. I choose smaller bulbs if I can find them, because the flavor of them is sweeter. Store shallots in a cool, dry location that is well ventilated. They will keep for about a month if stored correctly. 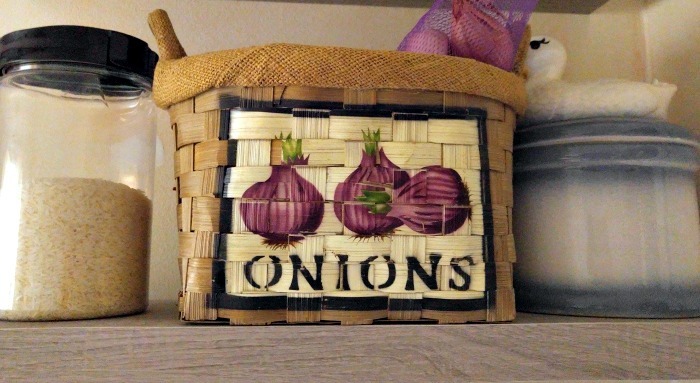 I have a straw onion basket that I keep on a high shelf in an unlit part of my kitchen. It has another shelf above it so the light is dim and it’s in a dry spot. The basket holds my shallots, garlic and onions and they keep well there for several weeks without sprouting. Shallots reproduce by forming a cluster of small bulbs instead of one large bulb, the way an onion reproduces. These multiplier shallots are a cool-season perennial but are typically grown as annuals in the summer garden. Depending on the type of shallot and the bulb sets, the planting time can be fall or spring. Bulbs planted in the fall will be larger and ready earlier than those planted in early spring. For growing shallots from sets, you plant the bulb sets directly in the garden in the same way as you would do for planting garlic or onions. They like full sun and a neutral soil pH. Seed grown shallots can be started indoors under grow lights in late winter so that you will have seedlings ready to set out about a month before your last frost. They like the cold. They will grow quickly compared to bulb seedlings. Growing shallots from seed gives you plants that will produce 3 or 4 shallots each. Those grown from sets will grow into dozens of shallots. The small shallot bulbs grow in clusters on a single base, in much the same way as the garlic plant does. If you don’t have room for onions in your vegetable garden, try growing shallots instead. Are shallots annuals or perennials? Shallots are a bit of an oddity. They are actually perennials plants but are cultivated as annuals, since they grow very quickly. It’s even possible to succession plant them for ongoing crops during the summer. Shallots tend to be smaller than onions so they will grow readily in pots. Be sure to choose a pot that will give them room for the bulbs to grow and spread out. 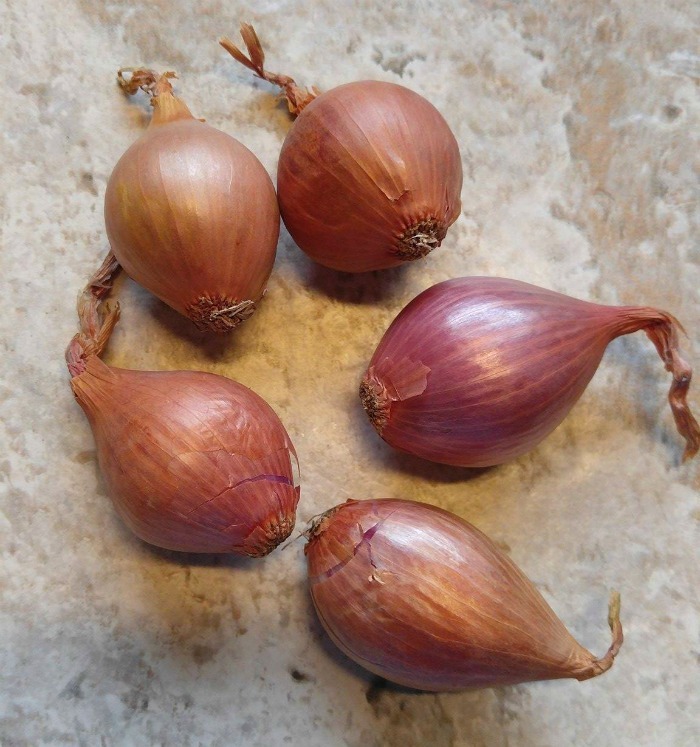 You could start growing shallots indoors in the winter but they do need quite a bit of light so will grow best outside on a patio if you do put them in containers. I even used a water bottle to grow shallots vertically. Place a large container that has good drainage in a spot in full sun. Space the bulbs about 2 inches apart and keep evenly moist. Fertilize monthly. 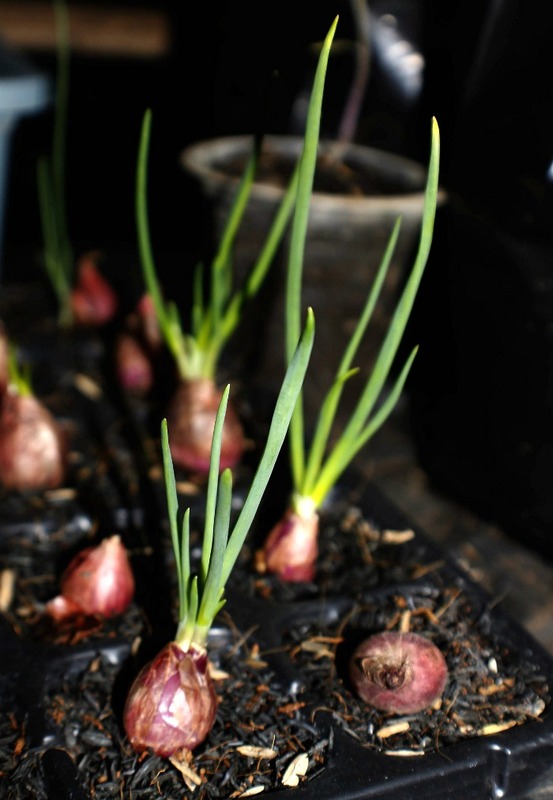 If you are interested in growing onions indoors, this article gives lots of tips for doing so. 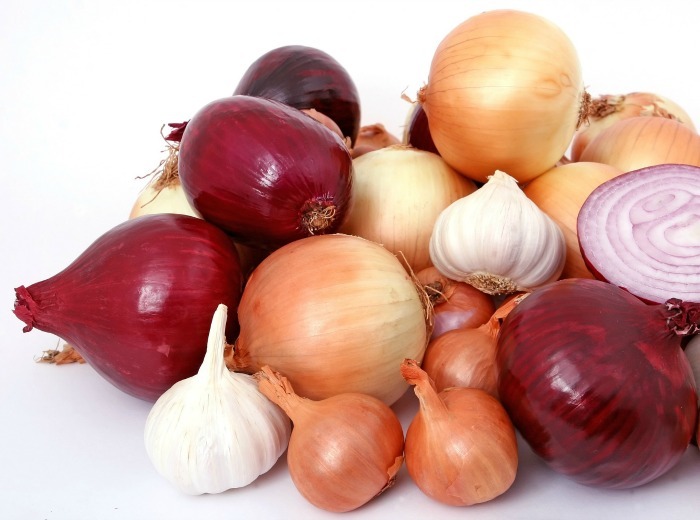 All types of onions can be grown from parts of the onion that is normally thrown away. Spring onions can also be grown indoors. For more tips on vegetables, be sure to visit my Pinterest Vegetable Gardening board. Admin note: this post first appeared in February of 2017. I have updated the post with more information as well as growing tips and nutritional info. Shallots tend to make much more beautiful wine sauces. I tend to go for Vidalia onions myself and to me these are in the same flavor range. They aren’t a bold strong bite but more of a background flavor that just adds more depth to your meal. Love that you actually put some recipes in the middle! It’s a great informative post, thanks! I don’t see anything about the bulb clusters that form on the top of the plants. Are these not shallots?